Road Safety Week is an ideal opportunity to promote life-saving messages and show your commitment to road safety to employees and their families, customers, suppliers and your community. 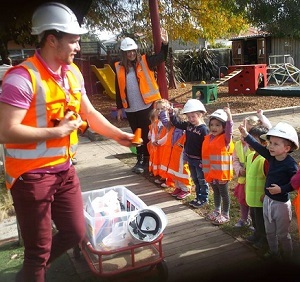 You could use the Week as an opportunity to train staff, raise awareness or partner with local schools, community groups and road safety professionals to promote safer roads. 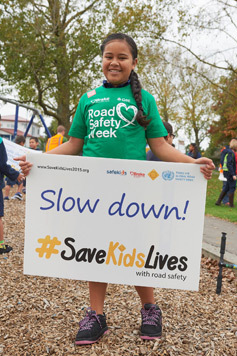 Many organisations use the Week to link existing activities to a national event, or as a springboard to launch year-round road safety programmes. Register to take part now! There are lots of quick and easy things that you can do to promote Road Safety Week online. Sign up for our free action pack and receive downloadable posters and social media banners you can use online. Publicise your Road Safety Week events and activities via Facebook and Twitter (#roadsafetyweek), with a link to this website. Write about local road safety issues or events on your organisation’s website. Promote road safety and Road Safety Week to your partners/suppliers/customers/business contacts through e-bulletins/messages on documents/your email signature. Promote road safety and Road Safety Week to staff by including information/road safety advice in your staff newsletter/magazine/intranet. A simple way to get road safety messages out to your staff, suppliers, customers and other visitors is with a Road Safety Week display. If you have space in your foyer or canteen, you can use posters from our action pack, and low-cost resources from the Brake shop, to give your display some interest and impact. You may want to include a laptop and big screen in your set-up, and encourage staff and visitors to make the Brake Pledge online. You can connect with people through social media, or, if you have time, by getting out and about in your community, holding awareness-raising events in schools and shopping centres, or inviting the press, to generate publicity for your activities. For further information, see the community campaign kit on the main Brake website. Run education/training to promote safe driving to employees/company drivers. Hold a road safety day at your offices with free basic safety checks on employees' personal vehicles by a local mechanic and information on road safety topics like vehicle maintenance and child restraints. You can find our advice on various topics here. Launch a new road safety initiative in your company/organisation. Fundraise by running a Bright Day for Brake (when everyone turns up wearing something bright in return for a donation!). Take part in Brake's Virtual Run, get a team together and raise funds. Fundraise for Brake in another way. Click here for ideas. If you manage at-work drivers, sign up to Brake Professional for more resources and ideas for getting them involved in road safety. Don't forget to register and tell us what you're planning so we can feature your activities on this site.